Kylee Wells, 10th grade, speaks to people about hunger in Montana and the nation. Volunteers help serve dinner to the public in St. Ignatius to bring awareness to the issues surrounding hunger. 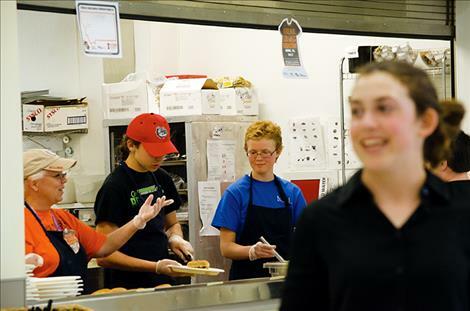 ST. IGNATIUS – A few of the students chosen by Governor Steve Bullock and his First Lady to work on the statewide fight against childhood hunger are from Lake County. According to a press release, 19 middle and high school students throughout Montana were selected to serve on the Youth Leadership Council and attended a training retreat at the State Capitol in the fall. In Charlo, 11th graders Sierra Hutchin and Vanessa Kent were chosen, and in St. Ignatius, Kylee Wells, 10th grade, was chosen. One of the ways the students brought awareness to the issue of childhood hunger was to organize projects to get the community involved during the week of April 17 including community dinners. 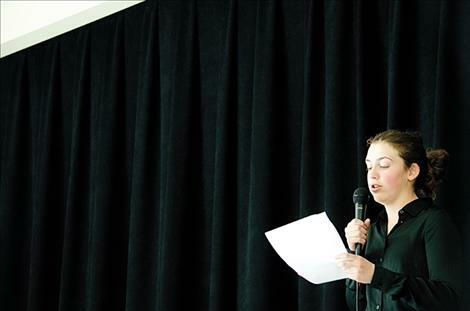 During a community dinner in St. Ignatius, Kylee stood on a stage and asked people to imagine always feeling hungry. “In Montana, 1 in 5 Montana children, age 18 and under, struggle with hunger,” Kylee said. She added that nearly 805 million people in the world are undernourished, which equates to 1 in 9 people, and every ten seconds, a child dies from hunger related disease. She recommends several ways to take action including volunteering to help a local soup kitchen or other organization, donating money aimed at feeding the needy, sharing knowledge about hunger, and supporting government run programs to give people food assistance. Kylee said the fight against hunger is an ongoing project and she challenges people to get involved.